AMBROSE, born to a Christian family in Trier, St. Ambrose was the son of the Praetorian Prefect of Gaul. He followed his father in an administrative career culminating in his appointment as governor of Aemilia-Liguria, with his seat at Milan. 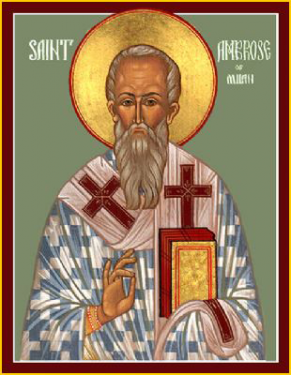 Upon the repose of the Arian Bishop of Milan, Auxeminus (374), St. Ambrose was chosen bishop by acclimation, even though he was still a catechumen. Initially he refused, but final accepted, and was baptised, and ordained. St. Ambrose gained fame as a preacher, a passionate defender of orthodoxy against Arianism, and was an important figure in the conversion of St. Augustine (28th August). He is credited with introducing a great deal of Eastern theology to the West, and encouraging monasticism. St. Ambrose introduced antiphonal singing, into the Western Church, was instrumental in making hymns an integral part of the Western Liturgy, and is believed to be the author of the Te Deum. shepherd and initiate of the mysteries, Ambrose. righteous father, entreat Christ our God to grant us His great mercy. ANIANUS (AGNAN), a fifth century Bishop of Chartres. BUITHE (BUITE, BOETHIUS), a Scot who went on a pilgrimage to Rome, and spent several years in studying Italy. Returning to Scotland, St. Buithe helped enlighten the Picts, reposing in 521. DIUMA, a member of the first group of missionaries invited to the Kingdom of Mercia in 653 by Peada of Mercia the son of King Penda. Following Peada’s succession to the throne, St. Diuma was consecrated bishop by St. Finan of Lindisfarne (17th February). The exact boundaries of his See are unknown, though St. Bede the Venerable (25th May) styles him ‘Bishop of the Middle Angles and the Mercians’. MARTIN of SAUJON, a disciple of St. Martin of Tours (11th November) who, following the repose of his spiritual father he returned to his place of birth and founded the monastery of Saujon. St. Martin reposed circa 400. SERVUS, a layman and member of the nobility in North Africa. St. Servus was tortured to death (483) for refusing to renounce orthodoxy Christianity during the reign of the Arian Huneric, King of the Vandals (r. 477–484). URBAN (URBANUS), according to tradition, a Bishop of Teano in Campania who reposed circa 356. VICTOR of PIACENZA, the first Bishop of Piacenza from circa 322 until his repose in 375. 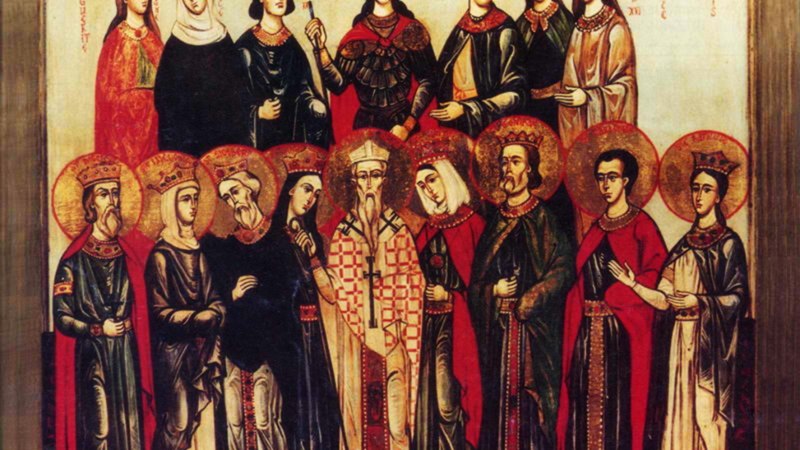 St. Victor was a resolute defender of orthodoxy against Arianism.